In order to create a comprehensive understanding of a Smart Farming Technology innovation system, Smart-AKIS has analysed successful innovation processes from the felt need and the origins of the innovative idea until its implementation and steps of its diffusion. Six examples of appropriate cases were chosen in close collaboration with the practice partners of Smart-AKIS and interactively studied the innovation processes at play as well as the roles and functions fulfilled by actors of the innovation system (advisors, researchers, private companies, vocational schools and other public agencies). We have named the 6 Innovation Cases as Smart-AKIS Stories as we look to provide insight and inspiration for new innovation processes in the development and adoption of Smart Farming Technologies. This video shows the innovation process of a cloud-based farm management software for fruit, vegetable and grain producers which refers to best farming practice knowledge. With the farm management software, farmers can plan all seasonal activities, track their execution and related costs. Advanced reports and dashboards help farmers to make data-driven decisions needed for improving their production. The software also integrates weather data to alert farmers about optimal times for spraying and pest control measures. Link to Farm Management Software video. This video shows the innovation process of the Arable Smart Sprayer, a web-based app to help farmers choose the ideal spraying time for their crops. Spraying conditions are viewed for the selected day and/or the next three days taking into account the current weather situation and the weather forecast. Spraying in optimal conditions helps avoiding spraying drift and resulting negative effects on the environment, improves the spraying efficiency and results in input reduction and cost savings. The app provides a real-time indicator for the optimal calibration for orchard mist blowers and tractors. Link to Arable Smart Sprayer video. This video shows the innovation process of the Section control in spraying, an automatic system of opening and closing nozzles and sections based on the location within the field. The system uses data on field boundaries and where the field has already been sprayed to automatically reduce the overlap of spraying tracks and outside of field boundaries. As such, this reduces the use, overdose, and drift of pesticides. The system functions autonomously and is not dependent on the driver or operator, leading to more reliable results. Link to Section Control on Sprayers video. This video shows the innovation process of Controlled Traffic Farming (CTF) which uses GPS and an autonomous system of driving for tractors, allowing farmers to use the same lane for cultivating in their fields. CTF decreases soil compaction and increases precision in labour and inputs (pesticides and fertilizers). Farmers thus benefit economically by saving materials (e.g. inputs, seeds). Moreover, there is a large environmental advantage for biodiversity in and around farms. Link to Controlled Traffic Farming video. This presentation shows the innovation process of Controlled Traffic Farming (CTF), which reduces soil compaction to narrow strips across fields and maximizes the area of undamaged soil for cropping by matching machinery tracks. This is facilitated by satellite guidance or with conventional marking systems. 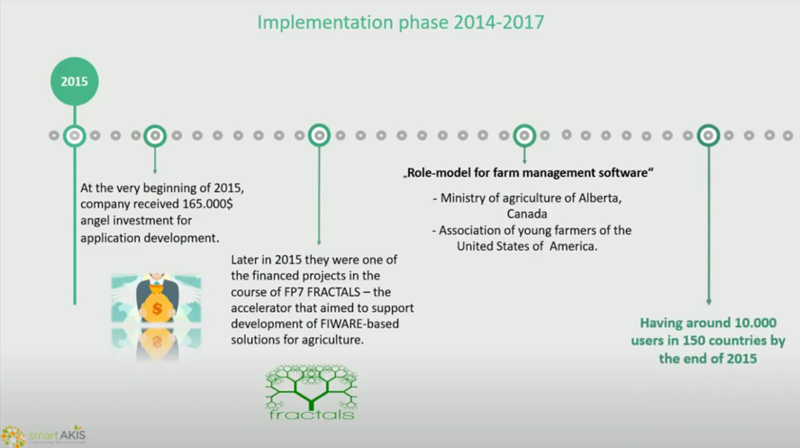 This presentation shows the innovation process of Trecker.com, a cloud-based farm management software solution that captures and documents information via smartphone while working on the field. The app processes automatically collected data on tasks, working time, costs, machines, supplies etc. into precise key figures for farmers’ costs and revenues. All data regarding finished tasks, incurred costs and working hours are automatically transferred to the acreage index. Farmers can also use software to create tasks, assign them to specific employees, and select fields, machines and resources.